What are your New Years resolutions? Whatever they are, I hope you succeed in your determination to make 2017 a great one! On top of our occupational exposure to stressors which can lead to mental illness, we have the same issues everyone else has which can lead to mental illnesses. This puts us at an even greater risk. 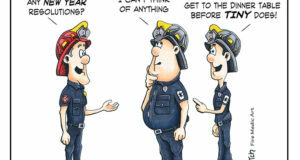 Ok, I admit that I haven't read them all....and some are picture books, others fiction, and yet some are simply leadership books and are not catered towards firefighters. However, this list of books includes many which are revered as the most important for firefighters to read and others are personal favorites of myself and other readers. Arrival video of an apartment fire in Alexandria, VA on November 11, 2016. It is refreshing to see more and more firefighters talking about this topic. BC Scott Steiner asks us all to be an advocate for mental health in your department. The Cleveland load (aka Metro load or Roundabout load) is handline load primarily used for high-rise applications from what I have found. Other applications would be when deploying a handline not pre-connected to the engine. Even though it took a while to get to know Willie, I think we are very similar. Minus the mustache, farming, cowboy boots, southern drawl...ok, maybe we are very different and that is why we got along so well.